Saving For Your Future » Investec Click & Invest Review – is it the best place for your money? Investec started life as a leasing company in South Africa in 1974 but has now become a global and multifunctional financial services brand, perhaps best known and most easily recognised for having a zebra in its logo. Its offering is beyond black and white money management. Investec offers specialist banking, wealth and investment, asset management and property services. This encompasses financial planning services for private clients as well as its own range of funds and savings accounts. The firm entered the UK market in 1991 and has been building its wealth and investment brand through the acquisition of UK private client firms Rensburg Sheppards and Wiiliams de Broe, which have history dating back to the 19th century in the UK. It is through its established Investec Wealth and Investment brand – which manages £25bn of private client assets – that the firm launched Click & Invest in 2017. What is Click & Invest? 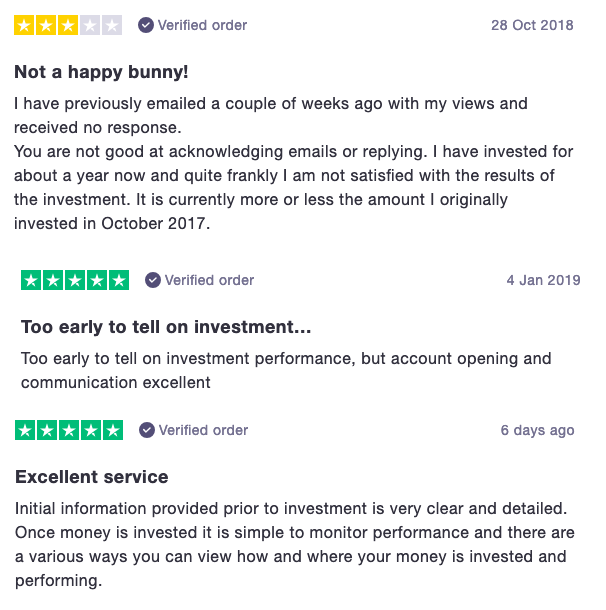 You would need a pretty big sum of money if you wanted Investec Wealth and Investment to build and manage a portfolio for you, but Click & Invest has been setup under the same umbrella to give users from the UK similar access to those with smaller amounts. It is a robo-style service that promises “high quality investment management in just a few clicks” and says you could have your money invested within 24 hours. Users can invest from a relatively low £2,500 and receive the same wealth management services as those who would be investing more through Investec Wealth and Investment. The service is similar to other robo-advisers with an online questionnaire that helps assess a user’s appetite to risk and build a portfolio to match, but while others will typically focus on passive funds, Investec takes an active approach. It has its own investment and research team that follows the almost 200 years of experience that the wider band has gained. The team builds an active portfolio of funds, chosen and regularly monitored by a committee. It is based on your own risk level and aims to beat, rather than just track the market. You can open a new ISA, transfer old ISA money or just have a general investment account with Click & Invest. There is currently no option to setup a pension, although this is apparently being worked on. How does Click & Invest work? Once you are happy with the projections you can create your profile. You need to give your portfolio a name such as retirement or family and can set up multiple pots so it is good to give each one a different label. With the name of your portfolio selected, it is time to go through Click & Invest’s attitude to investing questionnaire. 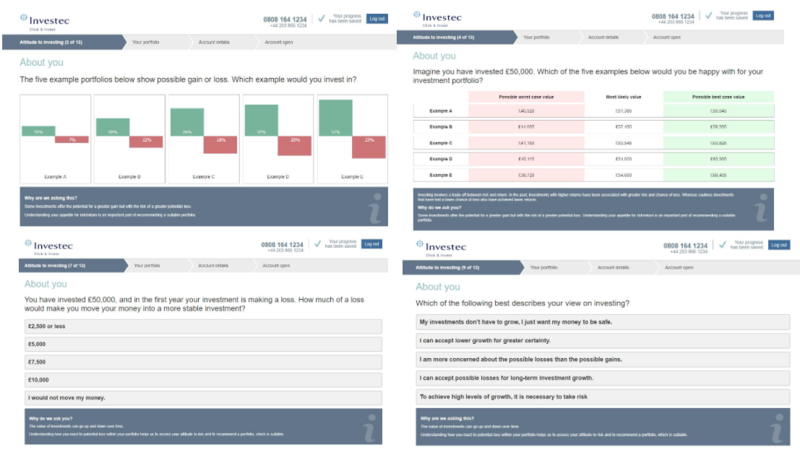 This questionnaire is based on an algorithm made up of 13 questions to get an idea of your investing experience, your attitude to risk and how much making a loss would affect you. There are warnings throughout the process that explain some of the questions, such as ensuring you have some rainy day savings before investing and highlighting that fluctuations in the value of your portfolio or any losses could impact your lifestyle. Click & Invest will recommend one of its investing strategies once the questionnaire is complete. There are five strategies that your money could be put into. Its defensive strategy is designed to provide capital preservation over the medium to long term for at least three years and is for investors willing to accept small short-term losses. One risk level up is its cautious approach, which aims for growth over three years with moderate short-term losses. The risk then steps up a gear on its measured strategy, aiming for growth over the long term of at least five years for investors willing to accept medium to short term losses. Braver investors can opt for its adventurous strategy, which also aims for long term growth over at least five years or there is an aggressive approach which has an outlook of at least seven years and is designed for those willing to accept large to medium term losses. The portfolios are built by Click & Invest’s 22-strong research team, which regularly scrutinises tens of thousands of investment opportunities worldwide including equities, bonds, alternatives, real estate, currencies, funds and gilts. Its investment committee meets regularly to review and select individual funds within each of the various investment markets. You can retake the questionnaire if you are not happy with the recommendation. Investors are also told what funds their money will be invested in and will get a breakdown of the assets, sectors and regions. Every three months you will receive a valuation report which includes a full breakdown of your holdings and the cash movements within your portfolio, as well as any charges. You are encouraged to review your answers at least annually, but you can change them at any time. Although Click & Invest cannot give you financial advice on the phone, it has an online support team that can help with queries. You can also access your investments online or via the Click & Invest App whenever and wherever you like and you will receive monthly written and video updates from its investment managers. Click & Invest charges one annual management fee on a tiered basis which is calculated and charged monthly. You will pay 0.65% on your first £100,000, 0.50% on the next £150,000 and 0.35% on any amounts above £250,000. There are no charges for withdrawals, transfers or for closing your account. One other fee you will have to pay though is fund charges, which averages at 0.81%, giving a total charge of 1.46% on investments up to £100,000. Click & Invest is regulated as an appointed representative of Investec Wealth & Investment Limited, which is authorised by the Financial Conduct Authority. This means it uses the regulatory permissions that Investec Wealth & Investment has but gives you get the same levels of protection. Investor money therefore must be held separately, charges must be made clear and customers must be treated fairly. Up to £50,000 of your money will be protected by the Financial Compensation Scheme if Click & Invest goes bust, but remember that doesn’t cover stockmarket performance. There is no recourse if the value of your portfolio collapses. Additionally, you can complain to the Financial Ombudsman Service if you are unhappy with how you have been treated. Click & Invest’s closest competitors are Nutmeg and Moneyfarm. The biggest difference is that Click & Invest will aim to beat the market with active funds, while Nutmeg and Moneyfarm simply track it by focusing on building portoflios with ETFs. The active approach of Click & Invest means it is actually more expensive than its rivals. Its platform fee of 0.65% may be lower in some cases, but the average active fund charges of 0.81% push up the overall costs. It also offers less product choice, with just an ISA and a general investment account. Nutmeg charges 0.45% on its fixed allocation portfolios up to £100,00 and 0.25% beyond, plus an average 0.18% fund fee. 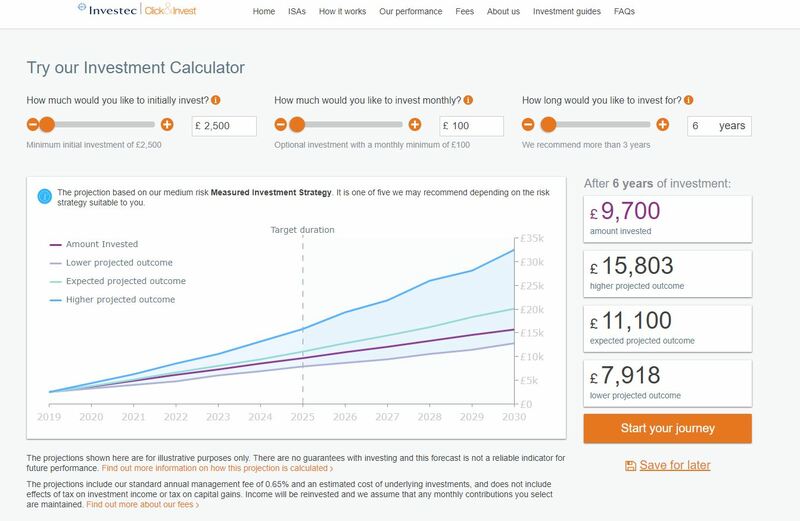 This means a £100,000 investment would cost £63, compared to £146 with Click & Invest. For its fully managed portfolio, Nutmeg charges 0.75% up to £100,000 and 0.35% beyond that, with an average 0.19% fund fee. 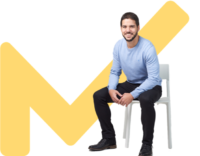 You can also begin investing for less at Nutmeg, with minimum investments starting at £500 for its ISA or general investment account. Nutmeg also offers a pension product, which Click & Invest doesn’t. You can find out more information in our full Nutmeg review. Similarly, robo adviser Moneyfarm offers ISA, general investment and pension accounts from a low minimum of £500. Investors pay 0.70% annually on the first £20,000, 0.60% on between £20,000 and £100,000, 0.50% on balances between £100,000 and £500,000 and 0.40% on amounts over £500,000. It has an average fund cost of 0.30%. Therefore, you would pay £90 on a £100,000 investment, compared with £146 with Click & Invest. You can find out more information in our full Moneyfarm review. Click & Invest is still relatively new in the robo-market having only launched in 2017. This means there isn’t much feedback both from customers and in terms of performance. 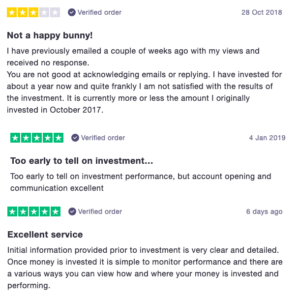 It had just 10 reviews on Trustpilot as of March 2019, 70% of which described it as excellent, praising the website for being easy to use and well presented. Its lowest ranking was average, with customers either saying they weren’t happy with the first year of performance or that emails haven’t been responded to. Click & Invest offers a low-cost, user friendly private client service and is a simple way of building an active portfolio. Investors get the benefit of Investec’s expertise at a fraction of the cost, but this is pricey compared with other robo services, albeit a different approach as competitors are mainly passive. An active investment strategy can be beneficial when markets are in a slump, as long as you can trust the fund managers to outperform, that is hopefully what you are paying for with this service. Having only launched in 2017 it doesn’t have any long-term performance data, but it has modelled its portfolios on past performance and found that if you had invested £10,000 in one of its five portfolios six years ago through Investec, the best performance would have been a 15.92% return in 2013 and the worst would be a 2.81% increase in 2015. Time will tell if these sort of results can be replicated.